Simon & Schuster Books for Young Readers, 9781442442917, 352pp. A heartwarming friendship tale—played out amid carpets of chittering insects, torture both corporal and psychological, the odd bit of cannibalism and like ghoulish delights. Being practically perfect in every way and someone who “never walked anywhere without extreme purpose,” 12-year-old Victoria resolutely sets about investigating the sudden disappearance of her scruffy classmate and longtime rehabilitation project Lawrence. After troubling encounters with several abruptly strange and wolfish adults in town, including her own parents, she finds herself borne into the titular Home by a swarm of 10-legged roachlike creatures. This abduction quickly leads to the discovery that it’s not an orphanage but a reform school. There, for generations, local children have had qualities deemed undesirable beaten or frightened out of them by sweet-looking, viciously psychotic magician/headmistress/monster bug Mrs. Cavendish. Victoria is challenged by a full array of terror-tale tropes, from disoriented feelings that things are “not quite right” and “[s]harp, invisible sensations, like reaching fingers” to dark passageways lined with rustling roaches and breakfast casseroles with chunks of…meat.
" The too-serene-to-be-true town of Belleville harbors some creepy secrets in Legrand's debut, a sinister and occasionally playful tale of suspense. 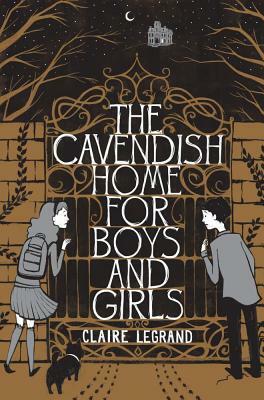 Twelve-year-old perfectionist Victoria Wright has bouncy curls, a fixation on achieving straight As, and just one friend—unkempt, artistic Lawrence, who she considers her "personal project." But when Lawrence disappears, and Victoria launches an investigation to find him, she discovers more frightening trouble than she imagined. Victoria unravels the mystery behind the titular home for children, which is run by the ageless Mrs. Cavendish and a fiendish gardener/assistant. Hair-raising adventures involving slimy hidden passageways, pinching swarms of cockroaches, mystery meat, and the wrath of cruel Mrs. Cavendish fill the pages. Legrand gives Victoria's mission a prickly energy, and her descriptions of the sighing, heaving home—a character in itself—are the stuff of bad dreams. Watts's b&w illustrations of spindly characters, cryptic shadows, and cramped corridors amplify the unsettling ambiance, and her roach motif may have readers checking their arms. Ages 10–up."